Do you want the pressure relief of a memory foam bed and the response associated with traditional innersprings? If so, the Lull could be exactly what you have been missing. Created by a man who was frustrated with the industry, Lull provides a deep value with their innovative product. Its online-only, bed-in-a-box sales model claims to provide the same worth as in-store brands that cost $2,200. This review of Lull’s mattress is based on our scoring system that includes characteristics such as support, quality, and comfort. Don’t have time for the full review? Check out our summary here. Have a partner or pets – Not only should people of all types experience a great night’s sleep due to its medium-level firmness, but motion transfer is minimal. Overheat at night – The top layer whips away and redistributes heat from the body. Its unique construction means you should not sink into the bed as much as other memory foams that tend to retain heat. Like a cross between classic and memory foam feel – If you like qualities of both but have never found one that has it all, this may be the mattress for you. This brand is more responsive than others and does not have hard springs. Prefer the typical memory foam experience – If you prefer sinking deep into a bed and lying in it instead of being gently cradled on top, you may want a different mattress (see our list of most popular brands in 2019). However, the construction helps ensure proper spine alignment through its support and boasts a quicker response time. Looking for even more options? Here's our complete list of mattress reviews. Lull is a unique memory foam bed with flair. The attractive polyester and rayon cover is functional. The soft, stretchy top is thicker than most beds, adding additional comfort. It holds up exceptionally well to tugging and pulling and can be easily removed for spot cleaning. Peeling back the cover reveals three different layers of foam on the 10-inch bed. The top layer is a 1.5-inch viscoelastic memory foam injected with gel polymer. Its open cell structure helps with airflow. Overall, the mattress provides a cooling experience, which is perfect if you sleep hot. This layer makes the mattress unique because it contains the only memory foam in the bed, which is less than others in the industry. 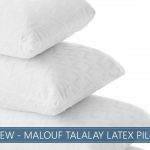 Because of this feature, sleepers can enjoy a rare combination of qualities, such as pressure relief and body conformity with more bounce back than classic models. The second layer consists of 1.5-inches of polyurethane foam. This acts as a transition from the top layer to the firmness in the base layer. It aids the base layer with spine alignment. The third layer is comprised of 7-inches of dense polyurethane foam that gives the mattress its support. While the other layers help with pressure relief, this level ensures that it will be stable and supportive for years to come. Most people find a medium-level firmness comfortable because it accommodates a variety of positions. Often providing enough pressure relief and support, medium firmness is a good versatile investment. 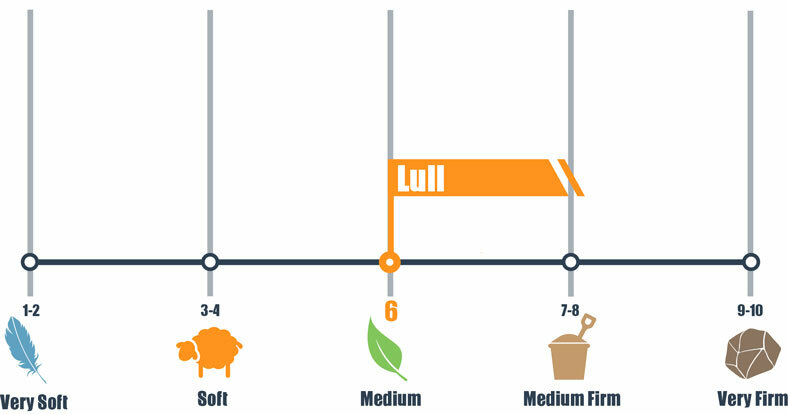 Lull has a medium-level firmness, which we rate a 6 out of 10 on our firmness scale with 10 being the firmest. While individuals have different comfort levels due to weight distribution and personal preference, most people will have a good experience. When pressing into the top of the bed, you will feel the cover’s softness and the memory layer. After removing your hand, you will see the medium-level responsiveness. Because the memory layer is small, you will likely not sink into the bed as much as expected when lying down. There is great lumbar support for light and medium-weight back sleepers. The bed cradles heavier body points (such as hips) and keeps the spine in alignment. Likewise, stomach sleepers can be comfortable and maintain proper alignment. Side sleepers should have the proper pressure relief they need at the shoulders and hips. Note that those with more weight may need additional support beyond what Lull provides. This is especially important for stomach sleepers, who tend to need and prefer more firmness to maintain proper alignment. For those who meet this criterion and are still interested, consider using the 100-day trial period to test it out. Heavier side sleepers may also need to take advantage of the free trial to see if there is enough pressure relief, especially if their shoulders are broader than average. 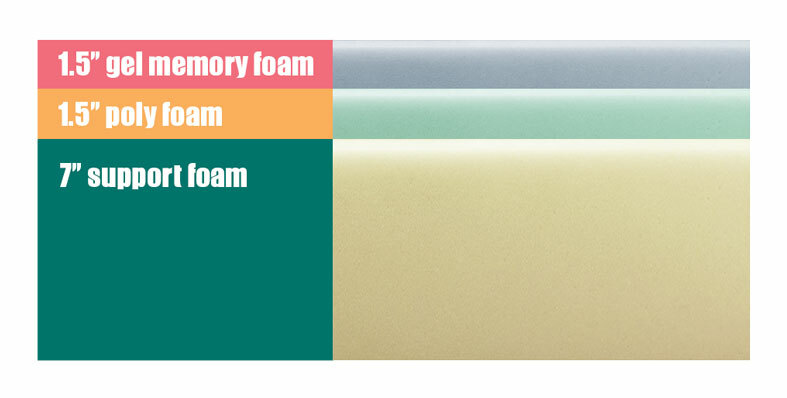 Memory foams are among the industry’s highest-rated products when it comes to motion transfer. While motion transfer is not typically a make or break item in terms of selection criteria, it is important for light sleepers and those with partners or pets who sleep with them. The top layer in the Lull provides excellent motion isolation. Whether jumping onto the bed or dropping weighted objects beside an object, there is minimal motion transfer. When lying down, expect to sink between 1.5 to 3 inches, depending on position. Due to overall weight distribution, those who lie on their backs should sink less, while those on their sides should sink more. Unlike similar brands, you should not sink too far down due to the sturdy poly base and thinner top. For most, it will be easy to move around and adjust, which is great if you switch positions during the night. Lull shines in the edge support category when compared to other foam and bed-in-box models (which typically do not perform as well as innerspring mattresses). This is in large part because of the dense poly layers that support the top layer. While lying on the edge, sleepers should feel supported. Unlike other memory brands that tend to roll the sleeper out of bed, there is stability with only a slight dip in the mattress. There is more pronounced sinkage when sitting on the bed’s edge, which is to be expected. However, it is less than many direct competitors’ and not often a deal breaker. Shipping – Free shipping. The product is compressed in the box, making it easier to get into your room than traditional store-bought mattresses. CertiPUR-US® Certified – The bed is free of or has limited formaldehyde, certain flame retardants, and other harmful chemicals that meet the CertiPUR-US® standards. This means that off-gassing (the mattress’ smell, which will diminish over a few days after airing it out) is minimized and you can feel more comfortable with the materials. Lull has industry-leading features and combines the best parts of memory and innerspring mattresses! Note: We did not include Trial/Warranty scores due Amazon Associates Program stipulations. While the perfect bed is different for every person, Lull has some great features and construction. With its ability to relieve pressure and maintain alignment, as well as capturing the best benefits of memory and innerspring mattresses, it should be a serious contender in your bed search. Since Lull arrives in a compact box, it is easily delivered to your house and maneuvered into the bedroom. With 100 nights to try it out and free returns, it is hard to find a reason not to purchase it. The owner has fulfilled his goal of creating a mattress that elevates the industry and gives people of all sleep styles a better night’s rest that they will love.